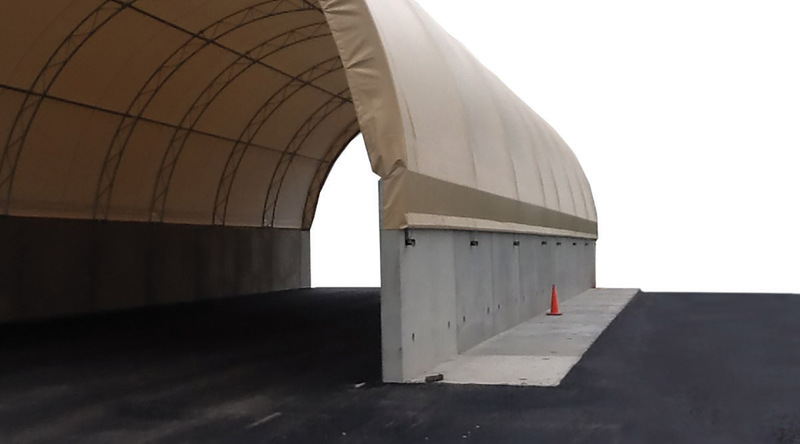 Keep your road materials safely covered and ready for quick deployment with a storage building system from Chemung Supply Corporation. Our precast concrete foundation wall system is perfect for Fabric / Steel frame Truss Arch Series Structures. Other optional roofing systems will also work such as timber framed truss roof systems. A common precast section is 8′ wide x 9′ tall x 10′ long. However, custom spans are possible based on the roof dimensions desired. Contact us with your storage capacity needs and we can design to git. Storage bins come in four standard sizes: 32′ wide, 42′ wide, 55′ wide, 72′ wide.